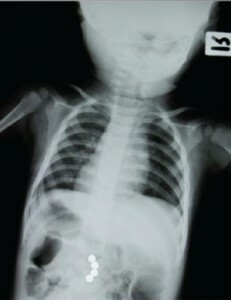 An x-ray reveals high-powered magnets inside a child’s body. In an effort to prevent more children from being harmed, the Consumer Product Safety Commission (CPSC) is suing to require the halt of sales of Buckyballs and Buckycubes magnetic toys. The CPSC filed an administrative complaint in order the protect the public from substantial risks of injury. The administrative complaint alleges that the super-magnets contain a defect in design, packaging, warnings and instructions. This severe type of legal action against a company is unusual, as this is only the second administrative complaint that the CPSC has filed in the past 11 years. The order seeks to prevent the selling of Buckyballs and Buckycubes, notify the public of the defect, and offer consumers a full refund. The products’ distributor Maxfield and Oberton Holdings of New York has said it will fight this action. Retailers such as Brookstone, Urban Outfitters, Amazon and eBay have agreed to stop selling these and other similar products. The CPSC has received reports of toddlers swallowing the small, strong magnets which can cause serious intestinal damage. When two or more magnets are swallowed, they can attract each other through the stomach and intestinal walls, resulting in intestinal blockage, blood poisoning, holes in the stomach and intestines, and possibly death. Adding to the problem, because parents might not even be aware that their child has swallowed the small magnets, doctors might not be able to diagnose the problem immediately, resulting in delayed treatment. Buckyballs and Buckycubes sets contain up to 216 powerful magnets in each set. More than two million Buckyballs and at least 200,000 Buckycubes have been sold in the U.S.
Tweens and teenagers who use the magnets to mimic piercings of the tongue, lip or cheek have swallowed or inhaled the magnets, which can cause the same medical issues as in younger children. The kids typically put one magnet on the outside of their lip and one another on the inside, so it appears their lip is pierced. However, the magnets do not stay in place and can easily be swallowed. A May 2010 recall of about 175,000 Buckyballs was issued because the toys were labeled “Ages 13+” and did not meet federal mandatory toy standards. This rule requires that powerful loose magnets not be sold for children under the age of 14. In November 2011, Maxfield and Oberton worked with the CPSC to educate consumers that the magnets were intended for adults and they pose a safety hazard to children. However, ingestions and injuries continued to occur, according to the CPSC. If you child has been seriously injured due to swallowing Buckyballs, Buckycubes, Nanospheres, Neocubes, Neoballs, Nanodots or Zen Magnets, you should immediately contact the personal injury attorneys at Carr & Carr. We have experience helping families of children who have been injured due to defective products including toys, furniture and cribs. Call 1-877-392-4878 or email us today. From our offices in Tulsa and Oklahoma City, our personal injury lawyers work with families across the United States.